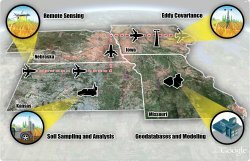 Results: Researchers developed a comprehensive technique to monitor changes in organic carbon found in soil over large areas of land. The team of scientists, including César Izaurralde and Tristram West at Pacific Northwest National Laboratory's (PNNL's) Joint Global Change Research Institute (JGCRI), are confident that spatial and temporal estimates of changes in organic carbon found in soil spanning vast areas can be drastically improved using a combination of satellite remote sensing, ground observations, and computer models. Why it matters: Organic carbon found in soil is important for ecosystem functionality, while increasing soil organic carbon storage contributes to mitigating climate change. Managing carbon can increase crop production and provide sustainability by improving soil, water, and air quality. Improved agricultural practices can recover much of the historical losses of soil carbon, thereby removing billions of tons of carbon dioxide, or CO2, from the atmosphere. Methods: The buildup of CO2 in the atmosphere is a result of burning fossil fuels for energy production as well as the historical and ongoing conversion of forests and grasslands for agricultural use. In North America, conversion of native grasslands and forests to agricultural use over the past 150 years depleted soil organic carbon, also known as SOC stocks, by 30-50%, with the majority of the depleted SOC released to the atmosphere as CO2. When crops are harvested, plant residue and roots are decomposed by soil microbes, which obtain nutrients and energy for their nourishment and, in so doing, release a good portion of the carbon back to the atmosphere as CO2. In aggrading natural ecosystems and well-managed agroecosystems, a portion of the added carbon is converted into soil organic matter. Conversely, intensive tillage, erosion, inadequate nutrient management, and conversion of forests and grasslands to agriculture can lead to carbon losses of up to 50% from that present in native ecosystems. The team's novel approach resides in the integration of multiple techniques to quantify and project SOC changes. 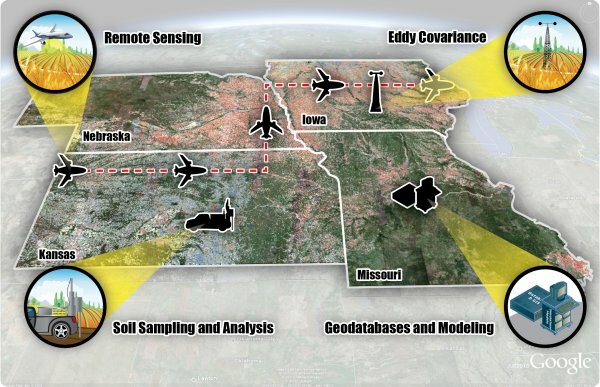 The combination of field-delineated spatial units; remote- and near-monitoring of land cover, crops, and surface residues; soil sampling; and simulation modeling can lead to significant improvements in the accuracy and efficiency of SOC monitoring. Advanced computational methods have been developed to determine SOC dynamics over large areas. Researchers expect to combine the best spaceborne, airborne, and ground-based measurement techniques with advanced computational methods to gain a more accurate understanding of SOC's spatial and temporal dynamics. What's next: The team is actively pursuing opportunities to implement pilot projects where carbon monitoring concepts can be tested over the course of several years. Acknowledgments: This work was supported by the U.S. Department of Energy's Office of Science and the National Aeronautics and Space Administration (NASA) Jet Propulsion Laboratory. The Joint Global Change Research Institute (JGCRI) is a unique partnership formed in 2001 by Pacific Northwest National Laboratory (PNNL) and the University of Maryland. Research Team: The research team includes David J. Brown, Washington State University (Pullman); E. Raymond Hunt Jr., Agricultural Research Service, U.S. Department of Agriculture; R. Cesar Izaurralde and Tristram O. West, JGCRI; Keith H. Paustian, Colorado State University; Charles W. Rice, Kansas State University; and Bonny L. Schumaker, Jet Propulsion Laboratory, California Institute of Technology. Reference: Brown DJ, ER Hunt Jr, RC Izaurralde, KH Paustian, CW Rice, BL Schumaker, and TO West. 2010. "Soil Organic Carbon Change Monitored Over Large Areas." Eos Transactions of the American Geophysical Union 91(47):441. DOI: 10.1029/2010EO470001.